Hasan Nuhanović was a translator for the UN when Serb forces took Srebrenica in July 1995. Forced to translate the order to send his family away, he never saw them again. He has dedicated his life to seeking truth and justice. Una Srabović-Ryan is a British Bosnian whose biological father was killed in the Srebrenica genocide. She was adopted at 6 months and moved with her adoptive family at the age of 5 to the UK. In 2016 she went to Australia to meet her biological mother. It was during her time there that she learnt of her father’s name and saw his picture for the first time. Her Royal Highness The Princess Royal represents the UK in Bosnia and Herzegovina at the Srebrenica-Potočari Memorial Complex on 11 July - Srebrenica Memorial Day. A message of support from the leaders of Northern Ireland's five main political parties. 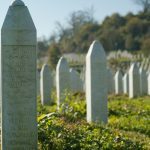 Remembering Srebrenica's education pack for the Scottish Curriculum for Excellence gained backing from the First Minister and four party leaders in Scotland. Students at Blackburn High School were challenged to think about how we can build a united community and learn the lessons from Srebrenica as part of Hate Crime Awareness Week.